Stunningly sleek and impressively versatile, our patented Nate Teacher's Station has it all, raising the industry bar on design, innovation and adaptability. Unique podium lifts, lowers and tilts with ease. Retractable return (left or right) almost doubles desktop. 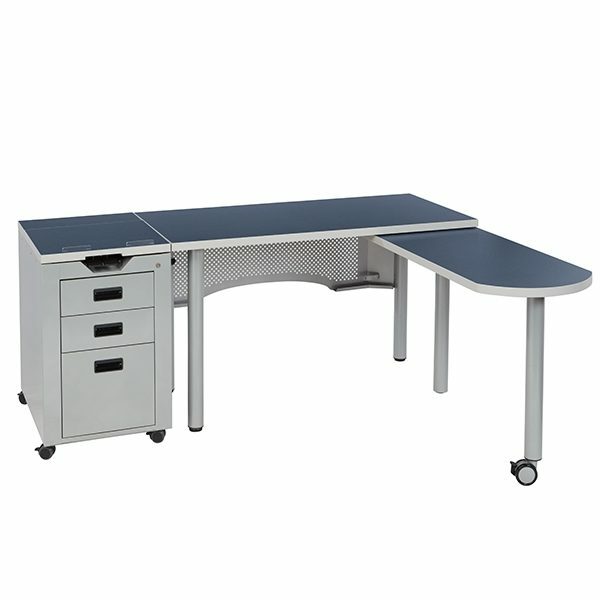 Locking drawers, modesty panel, reinforced tabletop, optional power supply. 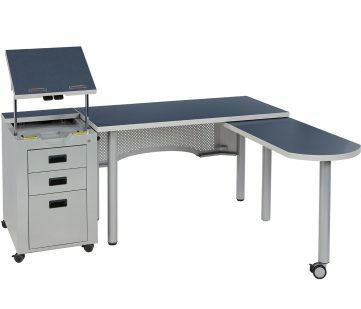 Detach the podium from the desk and move to the center of the classroom for lecture base classes. 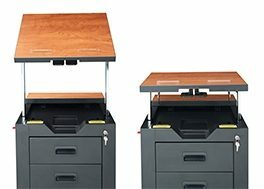 Tilt or adjust the podium up or down to your preferences. 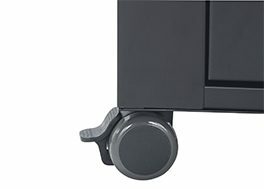 2 " braking casters allow you to move the podium around the classroom with ease. 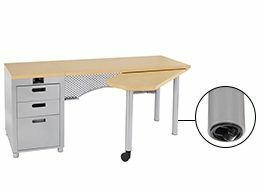 More space for Teacher-Student interactions with the retractable return. Conveniently placed insert caster allows for easy open and close. 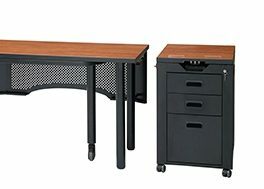 Explore the possibilities for this multi-use teachers station. Available in two frame colors and endless desktop options. 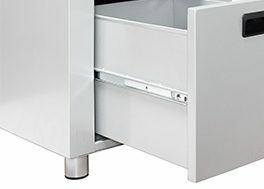 With a unique built-in podium, a simple pull of a lever can raise, lower or tilt lectern as needed. 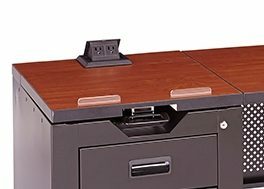 Retractable return allows for almost twice the desktop space, disappears when not needed. 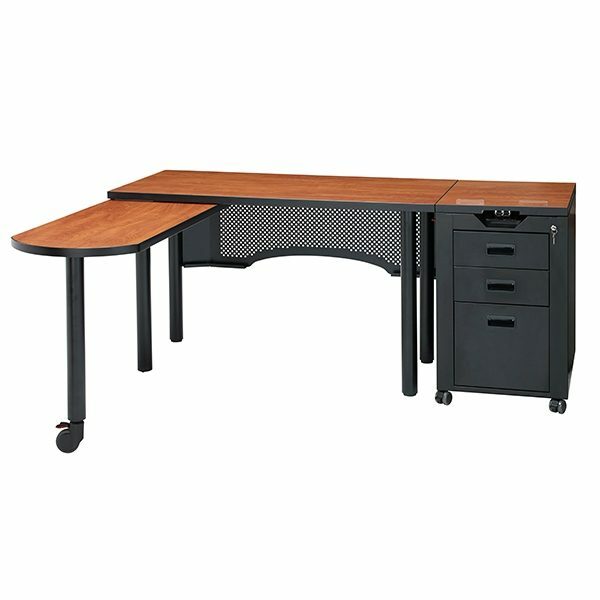 Enhancements include threaded inserts in table top, preset with steel into wood table top for years of long lasting and unshakable wear. 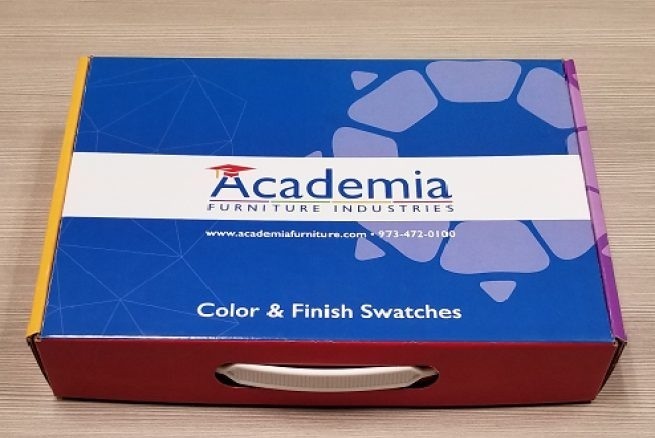 Tabletop: 11⁄8" fiberboard with high pressure laminate surface and black PVC edge banding. 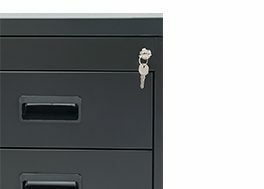 Podium: Powder coated steel box with 2 drawers and 1 ball bearing file drawer. Adjustable podium top ranging from 29"-42" high. Angled podium surface adjusting to 45 degrees. 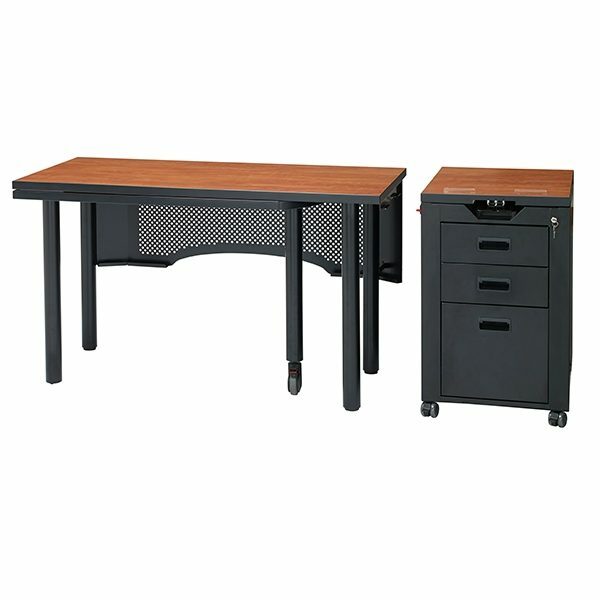 Legs: Three 16 gauge steel legs with 23⁄8" diameter, powder coated, screwed into heavy duty table inserts. Glide/Caster: A heavy duty locking caster for the extended pivot leg. Inverted caster for the inner pivot leg and rubber lined glide for the stationary leg.